We all like a decent takeaway every now and again but what if you could create your own takeaway style dishes at home? Obviously this doesn’t work with more complicated curries and there will be occasions when you just don’t feel like cooking. However, when it comes to stir fries, there’s really no excuse for picking up that phone. They are so quick and easy to make that you only really need a few minutes spare time to create a mouth-watering dish from delicious, fresh ingredients. Stir-fries are particular good choices for quick dinners as they’re so versatile. There’s no need to follow a recipe or stick to certain ingredients – you can be as creative as you like. You don’t even need to buy a special sauce. As long as you have some soy sauce in the cupboard, you’ll be fine. Whilst it helps if you have a wok in the house, don’t despair if not; you can still rustle up a decent dish without one and a big saucepan will do the trick. You can really add whatever vegetables you like to a stir fry although tried and tested winners include mange tout, baby corn, peppers, broccoli and bean sprouts, to name but a few. Most meat will work well but chicken and pork are good options if you’re a new comer to stir-frying. Prawns are also great in a stir-fry. You can either use fresh prawns, if you’re up for a bit of peeling. Otherwise, defrosted frozen prawns are fine. Just remember to take them out of the freezer in plenty of time. With regards to what to serve with your stir-fry, the quickest and easiest option has to be straight-to-wok noodles. You simply have to add the required amount to the pan towards the end of the cooking time and carefully stir them into the other ingredients. They will separate and take on the flavours in the pan. Then you just serve the meal straight from the pan. Use peanut of sunflower oil as they have a high heat threshold. Get the oil nice and hot before you begin. If you’re cooking chicken or pork, cut it into thin strips and cook this in the pan first. 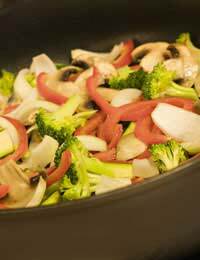 Remove and set aside while you cook the vegetables and then combine everything in the pan at the end. Try to cut the vegetables into similar size pieces. Add the vegetables in the order it takes them to cook: so add those that take the longest first. Don’t overcook the vegetables; they should have a nice, crisp bite to them. If you’re serving the stir-fry with rice remember to get this cooking in plenty of time so that it’s ready at the same time as the vegetables. A few spoons of peanut butter and a good dash of soy sauce makes a lovely, crunchy sauce for a stir-fry. Follow these simple rules and you should be creating delicious stir-fries in no time at all. A stir-fry makes a great impromptu meal for friends and it’s a very economical option if you’re cooking for a large number of people.